LuCinda creates herself a world of love and friendships during the late 1920’s through the war years. To everyone her life was hopeless and she was helpless. However, a little thing like that never slowed her down. 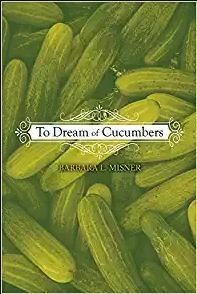 After all LuCinda had dreamt of cucumbers and she had true friends. Her art of multiplying friendships started as soon as she was old enough to walk the neighborhood. LuCinda’s ancestors had immigrated from England and built themselves a very rewarding life generations ago. Her ancestors had climbed the American dream latterly with nothing. They had strong family ties, a good life, and one day LuCinda’s father decides to move from that security to Wyoming. They knew no one in the west and had no idea how to even make a living there. Why? As the why’s grew, LuCinda was born into this family of fighting, secrets, and insecurity. Go on the journey with LuCinda as she gathers surprising and even shocking puzzle pieces. She finds the picture that emerges, is not as important as the journey. This book can be ordered from Amazon, and most common outlets. Barbara L. Misner was born and raised in a small town in Wyoming. Currently, she and her husband live in the same area where she was born. The couple enjoys their animals and spends outdoor activities together.